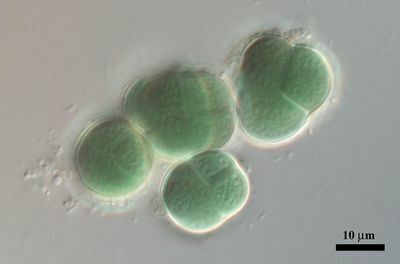 Chroococcidiopsis is a photosynthetic bacteria. It is a cyanobacteria (blue-green algae). It lives in water. It can survive high and low temperatures, high salinity (amount of energy cells use keeping the concentration of salt in them the same as out of them), and a lot of radiation. It is spherical and 2-6 µm (micrometers or microns) across. It also can produce oxygen. It could be able to live on Mars, because it can survive the things that would make other life not able to live on Mars. Because it can produce oxygen, people have thought about using it to create an environment on Mars that humans can live in, because they can also help with the soil. They also fix nitrogen. That means they use nitrogen from the air (N2) that plants can’t use, and turn it into NH3, NO2, and NO3 that plants can use. It also produces a neurotoxin called β-N-methylamino-L-alanine. If you consume it it can cause your nervous system to stop working or death. Like all bacteria, it has three protective layers, a membrane, a wall, and a capsule, a nucleoid at its center where the DNA is, and ribosomes to make proteins. It has thylakoids, for photosynthesis, and phycobilisomes, that help with photosynthesis. 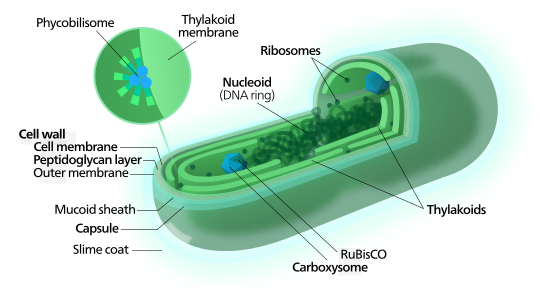 It has carboxysomes, for fixing carbon dioxide (it is not broken, see the paragraph about fixing nitrogen), and RuBisCO, which does the same thing, also helping with photosynthesis. Buy Electron Microscopes! Lower prices on everything! 888 Microscopes! ​This Electron Microscope Can See Everything Except Atoms! 100000x Magnification! 3 Nanometers! ​Magnify 60000x With This Electron Microscope!